Things About Who, What, When, Where and Why: Believe in Possibilities. I have photo impress 4. The fairy image is courtesy of Magic Moonlight Studios. and the background I believe is from Blogology. I have a list where to get lovely images so you may want to see there. and played with the texture. I love the final result. 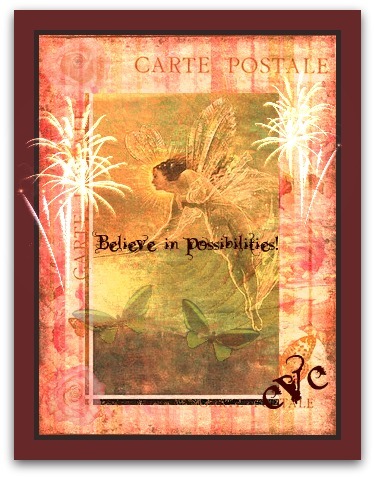 I have always had a love for fairies, they make me think anything is possible. My Godchild spent Saturday night visiting. She wanted to learn how to crochet. Sure go get the pail from the freezer and bring two spoons. and there we sat eating ice cream together out of the pail. She had never been allowed to do this before. but it was just about empty. and I said well there now the dishes are done too. She was grossed right out, oh she makes me laugh. The birds were singing and I was happy in my heart. what a perfect perfect weekend!!! sounds just exactly right. Thanks for your visits and comments, they always make me smile. I am really behind on my visits lately, but you are one I always come back to.